The Khewra Salt Mine (or Mayo Salt Mine) is located in Khewra, north of Pind Dadan Khan, an administrative subdivision of Jhelum District, Punjab Region, Pakistan, which rises from the Indo-Gangetic Plain. It is Pakistan’s largest and oldest salt mine and the world’s second largest. It is a major tourist attraction, drawing up to 250,000 visitors a year. Its history dates back to its discovery by Alexander’s troops in 320 BC, but it started trading in the Mughal era. The main tunnel at ground level was developed by Dr. H. Warth, a mining engineer, in 1872 during British rule. After independence, the Pakistan Mineral Development Corporation took over the mine, which still remains the largest source of salt in the country, producing more than 350,000 tons per annum of about 99% pure halite. Estimates of the reserves of salt in the mine vary from 82 million tons to 600 million tons. Khewra Salt Mine is situated in Pind Dadan Khan Tehsil of Jhelum District. Located about 200 km (125 miles) from Islamabad and Lahore, it is accessed via the M2 motorway, about 30 kilometers (20 miles) off the Lilla interchange while going towards Pind Dadan Khan on the Lilla road. The mine is in mountains that are part of a salt range, a mineral-rich mountain system extending about 200 km from the Jhelum river south of Pothohar Plateau to where the Jhelum river joins the Indus river. Khewra mine is about 288 meters (945 feet) above sea level and about 730 meters (2400 feet) into the mountain from the mine entrance. The underground mine covers an area of 110 km2 (43 sq. miles). Estimates of the total reserves of salt in the mines range from 82 million tons to 600 million tons. In raw form it contains negligible amounts of Calcium, Magnesium, Potassium, Sulfates and moisture, with Iron, Zinc, Copper, Manganese, Chromium and Lead as trace elements. Salt from Khewra, also known as Himalayan salt, is red, pink, off-white or transparent. In the early years of British rule, the Khewra mine produced about 28,000 to 30,000 tons per annum; it increased to about 187,400 tons per annum for the five fiscal years ending 1946–7 and to 136,824 tons for the two years ending 1949–50 with the systematic working introduced by Dr H. Warth. The mine’s output was reported in 2003 to be 385,000 tons of salt per annum, which amounts to almost half of Pakistan’s total production of rock salt. At that rate of output, the tunnel would be expected to last for another 350 years. The mine comprises nineteen stories, of which eleven are below ground. From the entrance, the mine extends about 730 meters (2440 ft) into the mountains, and the total length of its tunnels is about 40 km (25 miles). Quarrying is done using the room and pillar method, mining only half of the salt and leaving the remaining half to support what is above. The temperature inside the mine remains about 18–20 °C throughout the year. A 2 ft (610 mm) narrow gauge railway track laid during the British era is used to bring salt out of the mine in rail cars. Himalayan salt is Pakistan’s best known rock salt. It is used for cooking, as bath salt, as brine and as a raw material for many industries, including a soda ash plant set up by AkzoNobel in 1940. Salt from Khewra mine is also used to make decorative items like lamps, vases, ashtrays and statues, which are exported to the United States, India and many European countries. The use of rock salt to make artistic and decorative items started during the Mughal era, when many craftsman made tableware and decorations from it. Warth introduced the use of a lathe to cut out art pieces from the rock salt, as he found it similar to gypsum in physical characteristics. In 2008 the Government of Pakistan decided to sell off seventeen profitable organizations including Khewra salt mines, but the plan was shelved. The mine is now operated by the Pakistan Mineral Development Corporation, a government department. 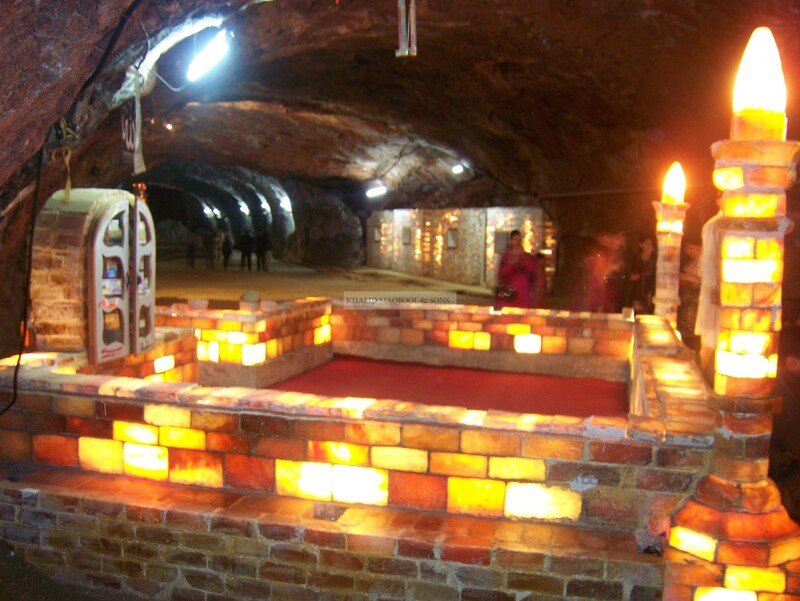 Khewra Salt Mine is a major tourist attraction, with around 250,000 visitors a year, earning it considerable revenue. Visitors are taken into the mine on a train. There are numerous pools of salty water inside. The Badshahi Mosque was built in the mining tunnels with multi-colored salt bricks about fifty years ago. Other artistic carvings in the mine include a replica of Minar-e-Pakistan, a statue of Allama Iqbal, an accumulation of crystals that form the name of Muhammad in Urdu script, a model of the Great Wall of China and another of the Mall Road of Murree. In 2003 two phases of development of tourist facilities and attractions were carried out, at a total cost of 9 million rupees. A clinical ward with 20 beds was established in 2007, costing 10 million rupees, for the treatment of asthma and other respiratory diseases using salt therapy. The “Visit Pakistan Year 2007” event included a train safari visit of Khewra Salt Mine. In February 2011 Pakistan railways started operating special trains for tourists from Lahore and Rawalpindi to Khewra. For this purpose the railway station of Khewra was refurbished with the help of a private firm.